Fridays From the Mortuary Reports – "Falling Off a Brick Factory"
It’s no secret that I’ve been combing through Green Hill’s burial records, or as they’re referred to on paper, the Mortuary Reports. 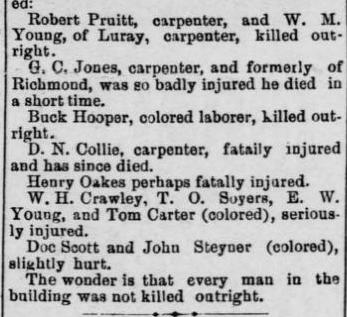 Two listings on the May 1889 page caught my attention. Robert A. Pruitt, 54, and Henry Oaks, “about” 24 had both died from “falling off” of J.G. Penn’s Brick factory during its construction. Robert’s date of death was May 30 and Henry’s was May 31. They were the only two names listed in conjunction with this particular tragedy. A dispatch from Danville, Va., says that city was, Thursday, May 30th, the scene of one of the most terrible accidents that ever occurred within its limits. On that day about 2:15 the fire alarm bell commenced tapping, and news began to spread over the city that the large brick factory of James G. Penn, under the course of construction at the corner of Bridge and Colquhoun streets, had been struck by a cyclone and raized to the ground, not one timber being left standing on another. The building was six stories in height and had been completed with the exception of the roof. The wind came from the south-east, and the dozen men at work on the structure had but little warning to make their escape before the crash came. A white man named E.W. Young, the boss brick-layer, was at work on the fifth floor and jumped from the building to the ground below, sustaining lateral injury, and had his shoulder injured; Tom Carter, a colored brick carrier, was on the sixth floor, and as the building separated went through to the cellar and suffered from a wrench in the back. Most of the brick-layers stopped work at 12 o’clock or the loss of life and injury to person would have been much greater. As it is two persons were killed outright and nine injured, four of whom have since died. In fifteen minutes after the alarm had been given through the city crowds gathered and in a driving rain went to work removing the debris in order to get those out supposed to be under it. After hard work the body of Will Young, white, a carpenter, was reached, and when taken out there was hardly a whole bone in his body. His neck was broken and resting on one of his legs, while the body was doubled up in a knot. The loss by the disaster will probably reach $12,000. Will Young’s body must have been a gruesome sight, as were the others even though we don’t have the grisly details of their bodies from the newspapers. Getting back to the two men from the burial records, Henry Oaks was actually 26 when the accident happened. Robert Pruitt was a private in Company C, 5th Virginia Cavalry Regiment in the 1860s. Civil War Soldier records described him as being 6 feet tall with a “sallow complexion, grey eyes” and dark hair. He was married to Emma Griffin and had six children, the youngest of whom was 10 when he died and the oldest being an adult. Robert and his family lived at 542 Floyd Street at least between 1881 and 1888. The other victims of the collapsed building were not buried at Green Hill, unless I missed something in the records. Historical Data Systems, comp.. U.S. Civil War Soldier Records and Profiles [database on-line]. Provo, UT, USA: Ancestry.com Operations Inc, 2009. The Dead Bell Blog at WordPress.com.